As my time in San Francisco comes to a year, I find myself more and more impatient. San Francisco has a lot to offer, but all the horror stories that you hear about the high rents, the tech bros, and the homelessness issues are also true. It's incredibly easy to get caught in the grit and the grime of the city, allowing it to overshadow everything else. Is that too negative? I've been accused many times of always finding something wrong and needing an attitude adjustment. Because despite all the flowers and delicate things you see on this blog, I'm naturally short tempered and hot headed in real life. Ironically, I don't actually think that these are negative qualities, but I do recognize that I need to reign it in and tamper it down every so often so I don't scare everybody away. And since I've never been that into yoga, one of the things that I do to chill out and calm the f*ck down is to bake a cake. Cake making is a surprisingly therapeutic activity. 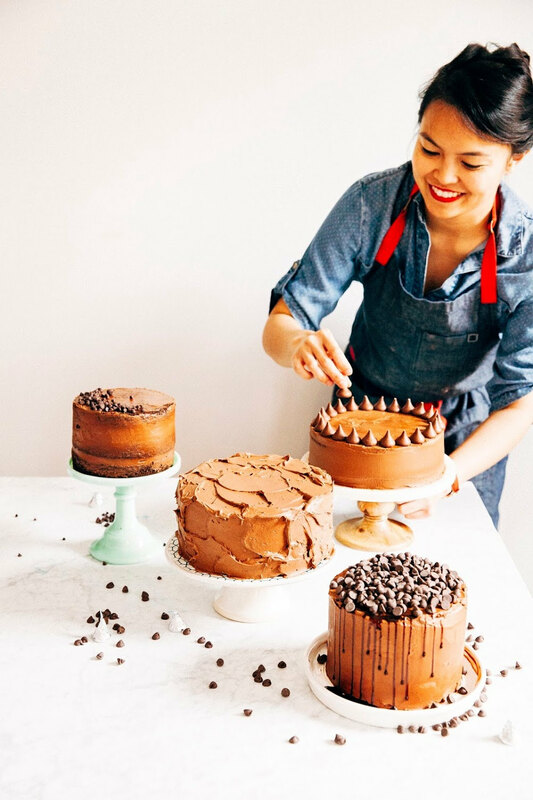 There's something really satisfying and calming about the process: stacking the cakes up perfectly, applying the layers of frosting, smoothing it over and over until it's perfect. When I do, it's like all the noise of the world fades away and I forget about all the things I hate. For a little while, at least. 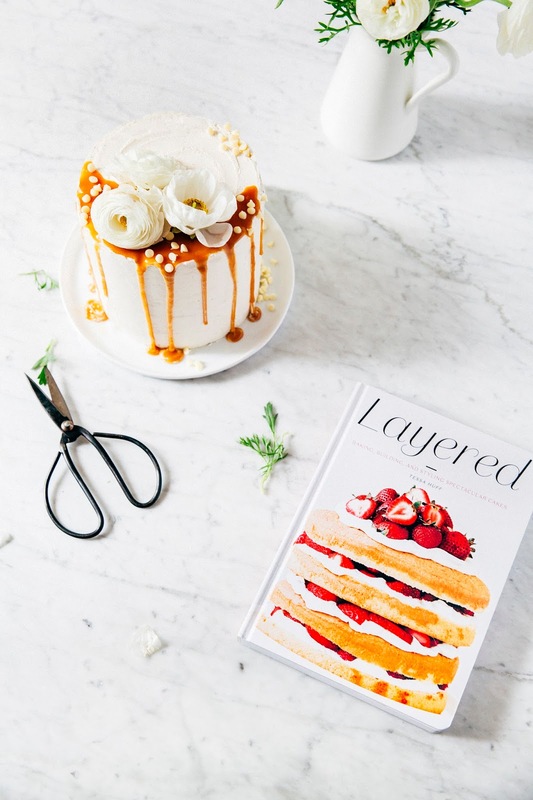 Which is why I've been spending a lot of time flipping through my blog friend Tessa's cookbook, Layered: Baking, Building, and Styling Spectacular Cakes. I've already told Tessa this, but everybody needs to know that homegirl is a cake making QUEEN. 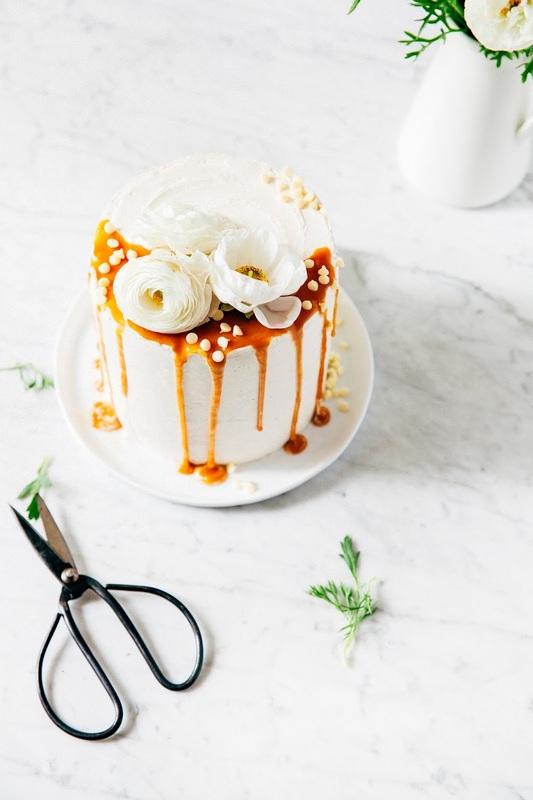 Her blog, Style Sweet CA, is full of beauties like this peanut butter caramel popcorn cake and this Italian rainbow cookie cake. 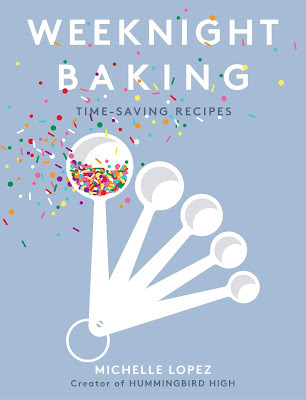 Her new cookbook is no different — I've already dogeared most of the pages, ready to bake one of her recipes for the next time my inner Hulk releases itself. 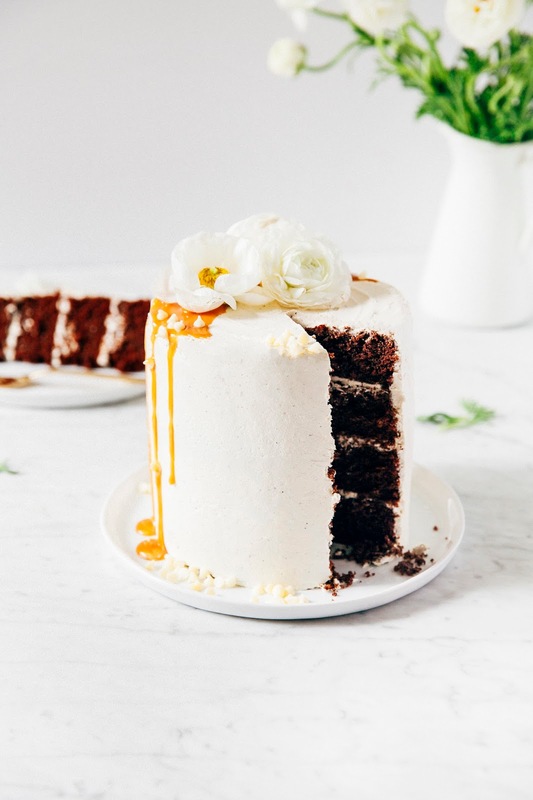 This chocolate and Earl Grey layer cake is one of the recipes from her book, and is basically a London Fog drink in cake form. It's perfect in every way. 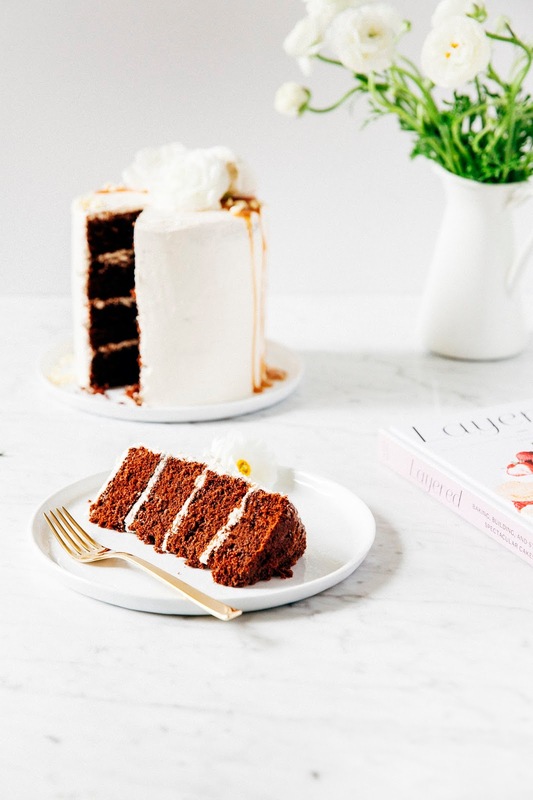 Tessa's recipe actually makes an 8-inch, three layer cake, but because I only use a countertop oven in my city apartment, all my cakes have been 6-inch, four layer variations. I've included the recipe as it originally was in her book, which will make a shorter cake than what you see in my pictures. If going the 6-inch route, bake the cakes for an additional 10 minutes and use 1/3 cup frosting between each layer. 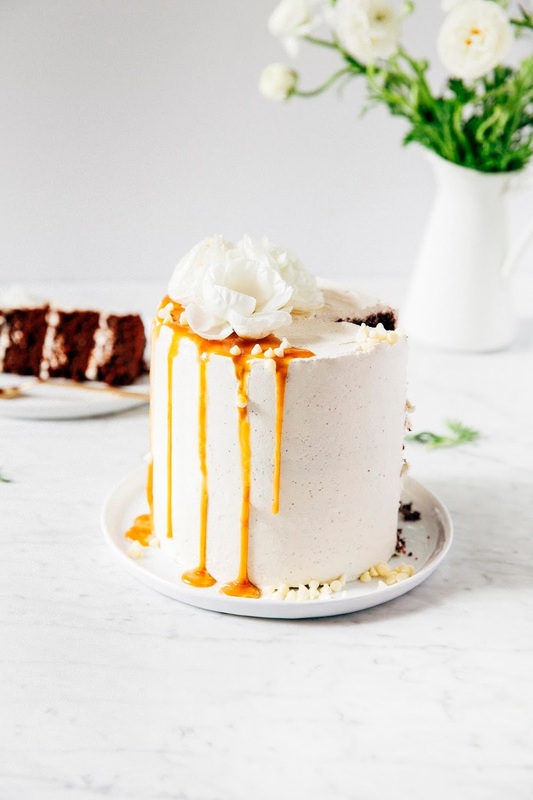 Tessa also includes a recipe for homemade salted caramel sauce, but I actually skipped making it from scratch and used this giant block of caramel from King Arthur Flour. It's perfect for time strapped folks, but be prepared to have a lot of caramel left over. Like, a LOT. 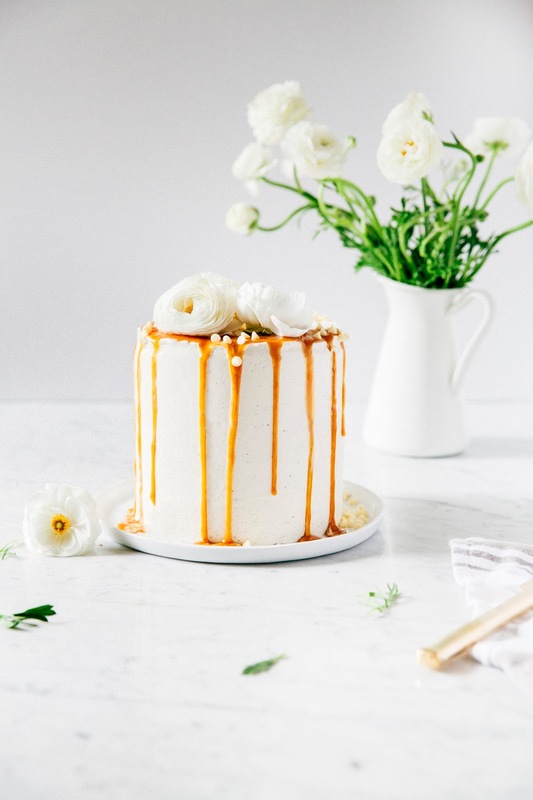 Also, make sure your caramel sauce has cooled to room temperature before pouring it over the cake! My caramel sauce was still slightly warm, and as a result, caused my frosting to get a little bit melty. It's hard, but you have to be patient! Center a rack in the oven and preheat to 350 (F). Prepare three 8-inch round cake pans by spraying generously with cooking spray, and lining the bottom of each with a parchment paper circle. Spray the parchment paper as well and set aside. In a medium bowl, whisk together 2 1/2 cups all-purpose flour, 1 cup natural unsweetened cocoa powder, 2 1/2 teaspoons baking powder, 3/4 teaspoon baking soda, and 1 teaspoon kosher salt. Set aside. In the bowl of a freestanding electric mixer fitted with a paddle attachment, beat together 1/2 cup plus 2 tablespoons vegetable oil and 2 cups granulated sugar on medium speed for 2 minutes. With the mixer on, add 2 large eggs, 1 large egg yolk, 2 teaspoons pure vanilla extract, and 1/2 teaspoon pure almond extract. Stop the mixer and use a rubber spatula to scrape down the bowl. Turn the mixer to low and add the flour mixture (from the 2nd step) in three batches, alternating with 1 1/2 cups whole milk in two batches, beginning and ending with the flour mixture. Stop the mixer and scrape down the bowl. With the mixer on low, stream in 1 cup hot coffee. Mix on medium-low for no more than 30 seconds, or until combined. Be careful not to overmix! The mixture will look like it's too liquidy and runny, but that's totally normal, I promise. Divide the batter evenly among the prepared pans. Bake for 23 to 25 minutes, or until a toothpick inserted into the center of each cake comes out clean. 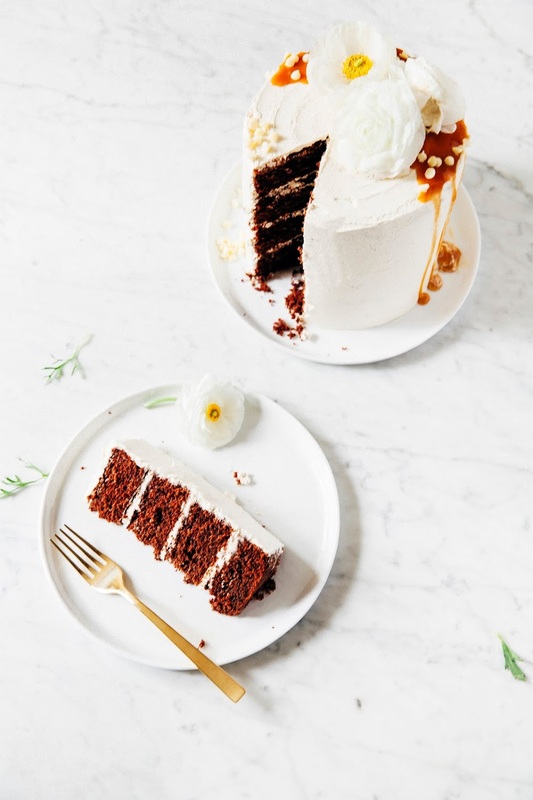 Transfer the cakes to a wire rack to cool for 10 to 15 minutes, before inverting the cakes out and allowing them to cool completely to room temperature before frosting. Place 1 cup (2 sticks) unsalted butter in a medium, heavy bottomed saucepan with 1/4 cup loose leaf Earl Grey tea. Place the saucepan over medium heat until the butter melts, before reducing the heat to its lowest setting and simmering for 5 minutes. Remove from heat and let the tea steep for 5 minutes more. Strain the butter through a fine-mesh sieve set over a bowl and refrigerate the strained butter until it reaches the same consistency as softened butter, around 20 to 30 minutes. Don't worry if there are small bits of tea in your butter — that's totally okay and will make for a pretty frosting. Place 4 large egg whites and 1 1/4 cups granulated sugar in the bowl of a freestanding electric mixer. Whisk the egg whites and sugar together gently by hand until combined. Fill a medium saucepan with a few inches of water and place it over medium-high heat. Place the mixer bowl on top of the saucepan to create a double boiler — the bottom of the bowl containing the egg whites and sugar should NOT be touching the water, so pour out any extra water you might have. Whisking intermittently, heat the egg mixture until it registers 160 (F) on a candy thermometer. Once it reaches 160 (F), remove immediately from heat and carefully fit the mixer bowl onto the stand mixer. With the whisk attachment, beat the egg white mixture on high speed for 8 to 10 minutes, until it holds medium-stiff peaks. At this point, the outside of the mixer bowl should be room temperature and no residual heat should be escaping from the meringue out of the top of the bowl. Stop the mixer and swap out the whisk attachment for a paddle attachment. With the mixer on low speed, add 1 1/2 teaspoons pure vanilla extract. Once the vanilla is incorporated, add the tea-infused butter (from the 1st step) and remaining 1 cup (2 sticks) unsalted butter a couple tablespoons at a time, only adding more butter when the previous butter pieces have fully incorporated. Once all the butter has been added, turn the mixer to medium-high speed and beat until the buttercream is silky smooth, around 3 to 5 minutes. Use immediately.